Gather with friends and family around this dining table to enjoy effortlessly fun meals outdoors. The table features an easy-to-clean and elegant glass top, while the base is made from aluminum with synthetic wicker. An Espresso finish completes the look, bringing rich tones to this tropical-inspired square table. 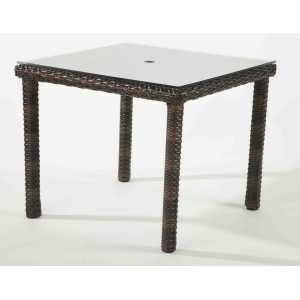 The Saint Tropez Dining Table by South Sea Rattan & Wicker at C. S. Wo & Sons Hawaii in the Hawaii, Honolulu, Oahu, Hawaiian Islands, Waikiki, Diamond Head, East Honolulu area. Product availability may vary. Contact us for the most current availability on this product. Relax outside in style with the Saint Tropez collection. Frames are made from aluminum, polypropolyne, and synthetic wicker for durability against the elements and a subtle nod to the tropics. Block legs and track arms create clean lines for a casual contemporary look that brings a level of sophistication to any outdoor space. The Saint Tropez collection is a great option if you are looking for Transitional Tropical Outdoor Furniture in the Hawaii, Honolulu, Oahu, Hawaiian Islands, Waikiki, Diamond Head, East Honolulu area. Browse other items in the Saint Tropez collection from C. S. Wo & Sons Hawaii in the Hawaii, Honolulu, Oahu, Hawaiian Islands, Waikiki, Diamond Head, East Honolulu area.